When life gives you lemons, make smoked trout, or something like that. With a forecast of just-a-chance-of-rain, I decided to risk it and plan a whole day of smoking for Sunday. Saturday, I picked up a small brisket, some trout fillets, and prepared a brine for the fish. Come morning, I’d planned on waking really early and firing up the smoker, since the brisket could take 8-12 hours. Alas, I awoke to a light, but steady rain. Plan B, start the brisket in the oven, and wait for the rain to clear. After rubbing the brisket in my favorite rub, Alexandria-locals Pork Barrel BBQ, I wrapped it in foil and threw it in a 300° oven. Meanwhile, I set the trout fillets in the brine I made the night before according to Michael Ruhlman’s Charcuterie to sit for a couple of hours. After a couple of hours, I figured I’d brave it and fire up the smoker even though the rain was still coming down. I followed my usual routine of dumping in some unlit charcoal and applewood into the fire ring of my Weber Bullet and starting up the chimney. 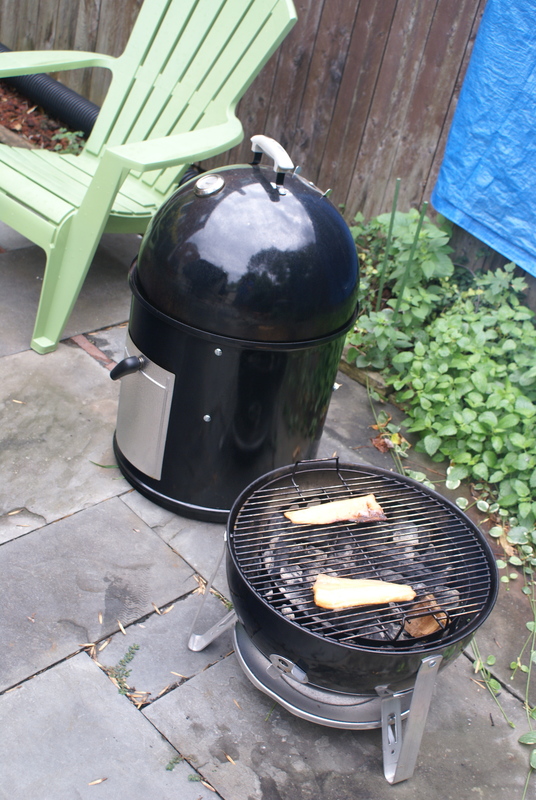 When the coals in the chimney got white-hot, I dumped them on top of the unlit coals and setup the smoker. After an hour, the smoker still hadn’t come up to temperature with the wind and rain still blowing. 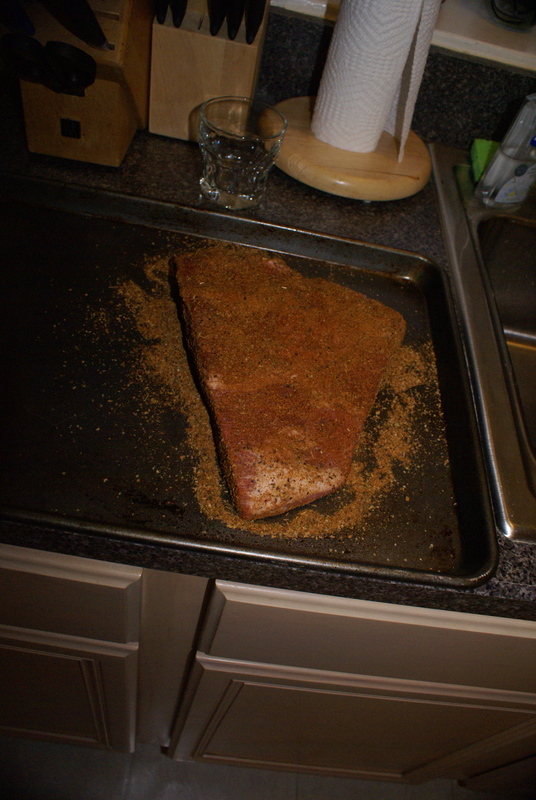 So, continuing on with Plan B, I ended up leaving the brisket in the oven for a little over 4 hours until it hit 205°. I left it wrapped in the foil on the stove to rest. Meanwhile, I had removed the trout from the brine after a couple of hours and left them to air-dry for another 2 hours. 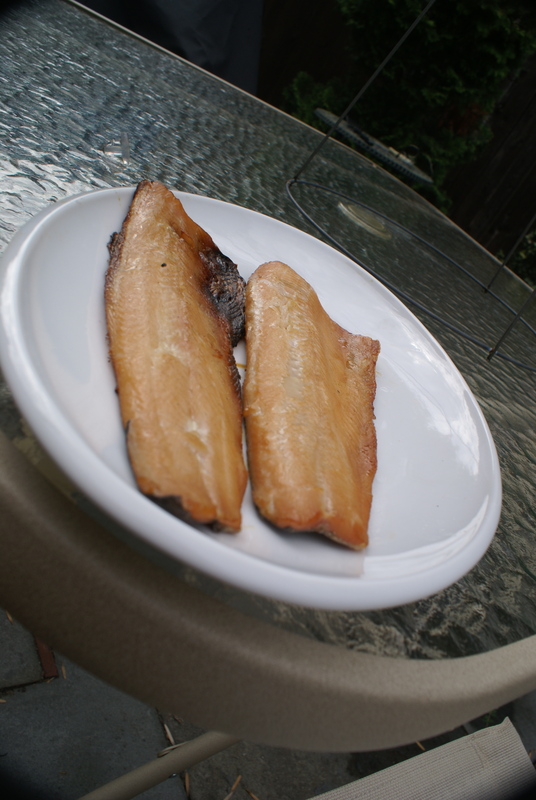 I still hadn’t figured out what I was going to do with the trout since the smoker was not cooperating. I was actually considering battering and frying them. Then I had the bright idea to remove the middle section of the smoker and put the fillets on a grill right over the smoldering coals. Sure enough, the temperature ended up being just right going this route. 45 minutes or so later, the fillets hit 140°, and I had two pretty tasty smoked trout fillets, pretty much just as I imagined them when I first unwrapped this smoker last Hanukah. One of these will be breakfast on a bagel for the next couple of days. The other is vacuum-sealed in the freezer, awaiting a Sunday brunch. I reassembled the smoker just to see if the whole thing could come up to temperature, so that I might add some smoke to my already cooked brisket. Sure enough, it took just a few minutes to bring the whole thing up to the optimal smoking range. So about 5 hours later, I finally throw that brisket on. It’s time in the oven and subsequent resting produced a very moist and tender brisket, but I wanted to see if I could a add little bit of a bark on it by smoking it for a little while. 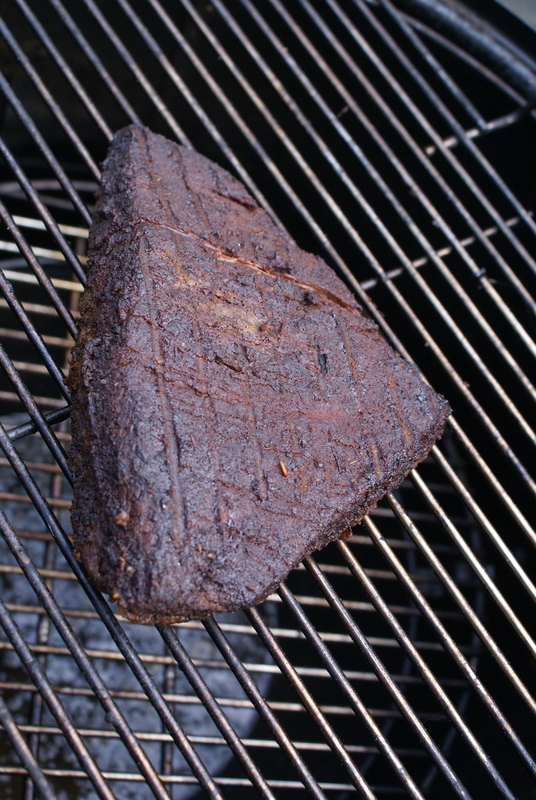 Indeed, 2 hours later, the crust of the brisket crisped up quite a bit, and while the smoke flavor was not very predominant, I still ended up with a delicious, tender barbecued brisket. Mix everything but the trout in a pot and bring to a boil to dissolve the sugar and salt. Let cool and put in refrigerator overnight. Clean off the trout and submerge in the brine for no more than 2 hours. 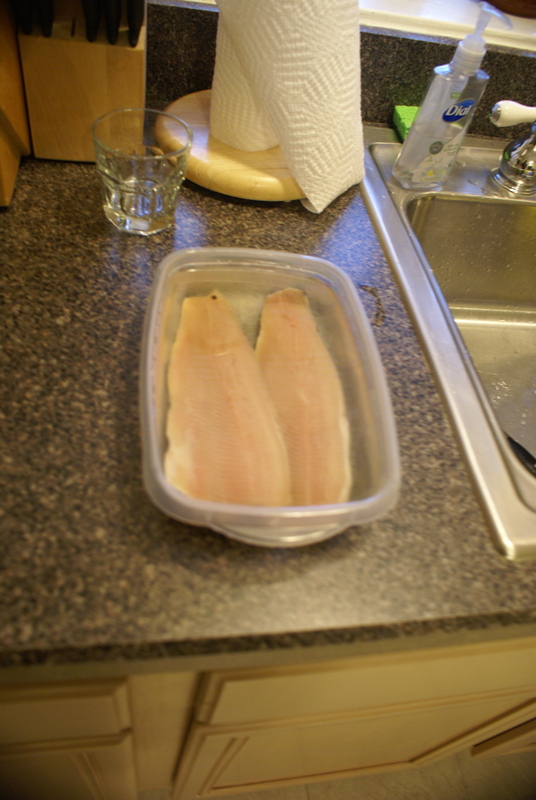 Remove the trout from the brine, rinse, and let air dry in the refrigerator for another 2 hours. Hot-smoke (200-225°) the fillets until they hit an internal temperature of 140°. I won’t bother providing much of a recipe, since today’s go wasn’t quite the way I would normally do it. Basically, rub that brisket down in your favorite rub, and hot-smoke it for 8-12 hours until it hits an internal temp of 205°.